The Church of San Costanzo (Chiesa di San Costanzo in Italian) is the most ancient catholic building on the Isle of Capri. Legend surround the church is that the Constanzo Patriarch of Constantinople found the island in the midst of a storm when he needed to take refuge there. He believed he was led there to convert the inhabitants to Christianity. Today, he is worshipped as the patron saint of Capri. In 987 A.D., the Archbishop of Amalfi created the diocese of Capri and replaced the Christian church with a Byzantine style church. It was the seat for the Bishop of Capri until 1596. When the Bishop’s seat was moved, this caused rivalry among the Greeks and the Caprisi. This brought about a tradition that is still practiced today. Every year, on May 14, the San Costanzo statue is transported in a procession from the Santo Stefano Cathedral to the church of Marina Grande where it stays for a week. This is one of the magnificent traditions that can be witnessed on a trip to Italy's Isle of Capri. 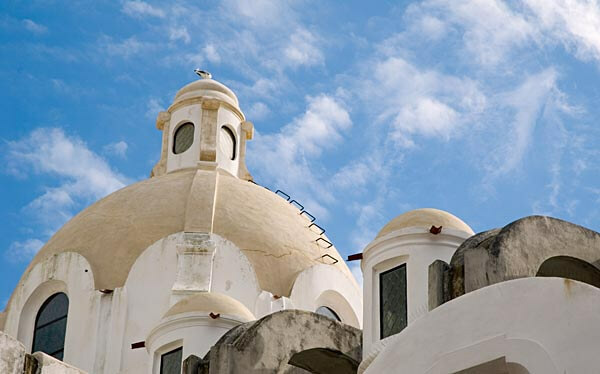 While you’re there, you can take in the ancient churches and wonderful history of this island. You can visit the Royal Palace of Caserta as well as Our Lady of Freedom Church whose festivity takes place in September. It’s a step back in time all around. Last updated by Heathr Rudebusch on 28 October, 2011 in Destinations.